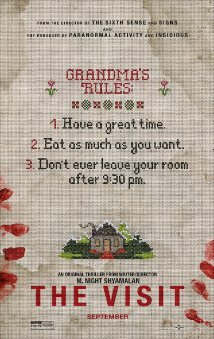 M. Night Shyamalan’s The Visit. Don’t forget to wear your diapers. Two kids, Becca and Tyler, go to visit their grandparents for a week. As their mother had a falling-out with them this will be the first real encounter they’ll have with their grandchildren since they were born. The mother does not want to reveal the reason of the rift but does feel the time has come for her children to finally meet her parents, even though she won’t be joining them. Becca is an aspiring filmmaker and decides to document the visit hoping it will reconcile her mother with her estranged parents. We get to see what happens via the images she and her brother shoot via their mini-cams, making this M. Night Shyamalan’s venture in the seemingly endless found footage horror sub-genre (Cannibal Holocaust, The Blair Witch Project, … ). Not long after their arrival the grandparents start acting somewhat strange. Are they suffering from an illness like dementia, or the sundowning syndrome or is there a more sinister reason for their behaviour? What made this film such a pleasant surprise is that Shyamalan injected a lot of humor in what would otherwise have been yet another thriller with cheap scares and a last minute twist. Not that Shyamalan’s film comes even close to Polanski’s ‘Rosemary’s Baby’ (1968) but the combination of horror and comedy works extremely well. So if your afraid to soil your pants, either due to the scares or due to laughter, be sure to wear your diapers. 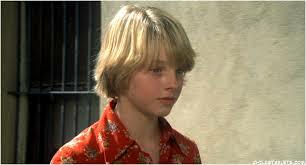 By the way, the young brother Tyler played by Ed Oxenbould is the spitting image of the young Jodie Foster in Scorsese’s ‘Alice Doesn’t Live Here Anymore?’ (1974). Where the Audrey character Foster played in ‘Alice’ was a delicious foul mouth the Tyler character likes to entertain is with some juicy rap lyrics. 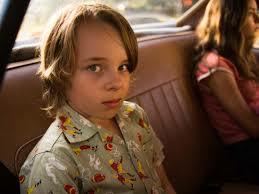 Next > André Delvaux’s: To Woody Allen, from Europe with Love.